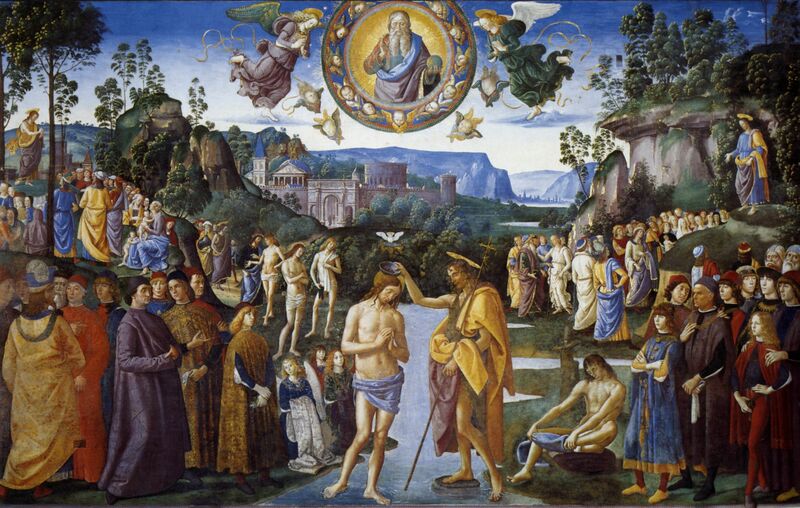 The baptism of Jesus by John the Baptist is present in all four Gospels as the beginning of Christ’s ministry. Scriptures don’t tell us conclusively whether Jesus himself baptized anyone, but his disciples certainly did. Baptism in water – and later in the Spirit – is an essential element of the Christian tradition. Yet somehow it’s one more thing Christians can’t agree on. Many denominations practice infant baptism. Others practice a believer’s baptism only for people who are of age and confess to salvation in Christ. Both find Biblical support for their position. Some others, particularly among Evangelical and non-denominational churches, don’t require it. Methods vary from sprinkling to total immersion. Beliefs about baptism range from an absolute necessity for salvation to a symbolic act of publicly acknowledging one’s faith. Beliefs about re-baptism are all over the map. This devotional isn’t about convincing anyone about the meaning of baptism … but perhaps we can use it as a model to examine how we might reframe contentious conversations. Some people try to convince us their understanding of baptism is correct because they just have to be right, but many – particularly on the side of baptism as an absolute necessity – are actually adamant about their position because of love. If you believed you could save someone from death or suffering by pointing out the speeding train, wouldn’t you? And if you believed the train someone pointed out was a false alarm, would you be angry at them for being wrong or would you appreciate their concern? No one wants someone else’s beliefs forced on them, but is it possible we can become so eager to take offense and to assume intent that we perceive every expression of a different opinion as a point to be argued? Whether we choose to hear “your soul is important to me” or “you’re going to hell” is often a decision (sometimes unconscious) that makes a difference in how we respond. We can say “I disagree” instead of “you’re wrong!” We can listen. And if we believe it’s a matter of life or death, our most convincing evidence may be how we love. Challenge: … but we might have to be less defensive for it to happen. Prayer: God of Love, where this is discord, may I sow peace. Amen. Discussion: When has changing your attitude changed a conversation?